Even now, almost twenty years after his death, it’s difficult to separate the man from his work. Both burned brightly, bursting with energy. Now only the paintings remain. Mutatis Mutandis- the more things change, the more they stay the same. The large oak tree that spreads over the lawn next to the UC Santa Cruz art department could well have those words etched into its bark, or so I thought on September 28. I stared long and hard at that tree while listening to people share memories of Eduardo Carrillo, who dies too young and too suddenly in July. Eduardo was a professor in the university art department. We assumed that, like the familiar oak tree, Eduardo would be there tomorrow and the next day—his characteristic generosity and good humor being something that all who knew him could depend on. Judging from what was said on that hot late summer afternoon, I was not the only person who felt a debt of gratitude for the many ways that Eduardo gave of himself to me and to the world. Eduardo was very much an “everyartist,” which is not to say that his work was in anyway mediocre-far from it. Rather, he was an “everyartist” in his focus on using his own experience and values as a basis of his work as well as an “everyartist” in his isolation from and indifference to the fashions of the art world, which he viewed as a grand spectacle of venal ambition, institutional self congratulation and absurd exclusionism well before those endearing attributes were satirized by Jesse Helms and Morley Safer to dire political consequence. It was and remains a world whose values had little to do with the things that Eduardo prized, down-to earth things like dedication, family, friends and the delicate fragility and wonder that seeps out of momentary existence. These are the salient attributes of Eduardo’s paintings. If we are forced to call his paintings “Magic Realism” for want of a more apt category, it is because Eduardo was keen to see the magic veiled by everyday reality. Whether he was painting a mural or a watercolor, he held his work accountable to this fundamental aesthetic value. This begs the question of why these values are considered an anathema by the larger art world, and the only short answer that I can advance is that said world has been far too busy trying to manufacture meaningful history of lived experience. This is a sweeping statement, and like all sweeping statements, it will fail the closest scrutiny at some points.. Accomplished muralist and UC art professor Eduardo Carrillo dies in Tijuana on July 14. The internationally known artist, who drew his inspiration from ancient myths, Chicano culture and desert light, was 60 years old. Mr. Carrillo died at a hospital where he was beginning treatment for cancer. A group of 25 family members and friends accompanied his ashes to San Ignacio, in Baja California. It is fitting that Mr. Carrillo was buried in the central Baja mission pueblo of San Ignacio. The pueblo played an essential role in his life. That was where his mother was born and he spent many boyhood summers. It is also where he made semi-annual visits to his desert studio, discovering the possibilities of subject and light. The youngest of five children, the artist was born in 1937 and raised in East Los Angeles. As a youth he attended local schools. He earned his bachelors and masters of fine art degrees from UCLA in 1963. A year in Spain, painting in the Prado in Madrid, confirmed his ambition to devote his life to painting. In 1966, he and his first wife Sheila, moved into the ancestral home in La Paz, Mexico, where he founded and directed El Centro de Arte Regional, a center for the revival and study of regional crafts. In 1969, he returned to California to teach for two years at Sacramento State University before he was called to UC Santa Cruz, where he has been a respected member of the faculty for 25 years. He taught drawing, art history, ceramics, shadow puppetry, mural, fresco and his primary focus, oil and watercolor painting. He created set designs for local theater productions, brought art programs to children and teenagers, and supported emerging artists in the Beach Flats area. His work has been exhibited for 40 years in dozens of solo and group shows in museums and galleries throughout the U.S. and Latin American. One of his exhibitors is his friend, Joseph Chowning, owner of a large gallery in San Francisco. Chowning would accompany Mr. Carrillo on trips down to San Ignacio. “Even when he was driving, he was always thinking about something other than the mundane.” Chowning said. “It was obviou he was thinking about something else and usually that involved painting. Mr. Carrillo’s themes delved deeply into his Mexican roots, including the pre-Columbian era and more recent historical topics. One of his major works is a large and dramatic tile mural at the Placita de Dolores in Los Angeles. He had another mural at the Palomar Arcade in Santa Cruz. The artwork was later destroyed. He is survived by his wife, Alison Keeler Carrillo of Santa Cruz; a daughter, Juliette Carrillo of Los Angeles; a son, Ruben Carrillo of Honolulu; a stepdaughter. Bhavani Parsons of Paris; three sisters, Georgina Ossorio of Miami, Mary Black of Burlingame and Patricia Mullins of Huntington Beach; a brother, Alex Carrillo of Northridge; and a grandson. A memorial celebrating his life will be at 11a.m. Sept 28, at the Baskin Visual Arts Courtyard at UC Santa Cruz. A painting and drawing scholarship has been established in his name. Adios, Eduardo, UCSC Professor of Art Eduardo Carrillo died on July 14, 1997, leaving a rich legacy of artwork and a collective broken heart. Born on April 8, 1937 in Los Angeles, Carrillo attended Los Angeles City College before taking his BA and MA degrees at UCLA. After a year in Spain-studying and painting in the PRA do-he and his first wife Sheila moved to his family’s ancestral home in La Paz, Baja California where he founded and directed El Centro de Arte Regional, a center for the revival and study of regional crafts. The gifted painter and muralist had already enjoyed many solo exhibitions of his bold artworks in both Mexico and southern California before joining the faculty of UCSC in 1972, where he taught a variety of subjects- drawing, art history, ceramics, shadow puppetry, mural, fresco as well as his primary media of oil and watercolor painting- for the last 25 years of his life. 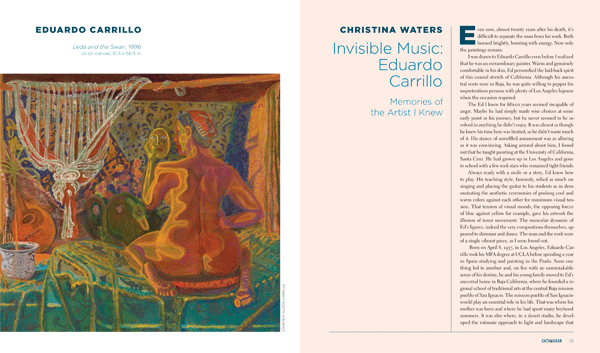 Exhibiting his work on both coasts of North America, Carrillo was represented by LA Louver Gallery in Venice, California and at Joseph Chowning Gallery in San Francisco. Memories of Eduardo always begin with his smile, always hugh with high spiritedness-barely deflecting attention from his astonishing blue eyes. The smile- a permanent possibility of who he was in the world- fed from the same spring as his immense talent. Somehow about light and color, always about irrepressible sweetness and humor, that spring seemed unquenchable. Even now that he’s gone, it still seems so. Probably because Ed Carrillo celebrated, loved, catalogued and anthologized, wore his gift so lightly. He never took it seriously that it couldn’t be suspended while he explored some moment of friendship. Part trickster god, part transcultural poet, Ed was an inspiration to his students and colleagues alike. Armed with the instinctive immediacy of a perpetual child- fascinated with the colors, shapes, textures and rhythm of the sensory world- Ed probed and prodded the land, here and in his beloved Baja, where he’d go each year to putter with a favorite uncle, soak up the light of his grandmother’s village, work on a never-ending building project and open himself to inspiration. About 10 years ago, a whole new window opened on his life with the meeting of Alison Keeler, who became his second wife. There had been allot of love in Ed’s life, and Alison was the crowning joy in that legacy. Colors for Carrillo existed in the service of light, transforming themselves magically before your very eyes- into the light of an early afternoon in Ed’s beloved Baja. Here the light is so intense that colors get distilled twice, like good tequila, into something potent enough to rediscover what you take for reality. Magic realism. Before the term found currency in literature and film-making, Carrillo was robustly, quietly inventing it. Driving the everyday, the humblest into mythic moments, painting the human into countless gods every single one of them capable of simultaneous laughter and destruction. Ed’s figures, always monumental and earthy, were more sculpted than painted. They bore a fundamental sense of physicality that seemed directly descended- or perhaps ascended- from muralists like Rivera and Oliveros. Solidly grounded in a world that frothed and spiraled around them like dancers in a fiesta, or warriors poised to conquer some jungle enemy, his all -too-human subjects seemed to wink even in their martyrdom. Ed’s Blessed Virgin drinks coffee with the babes who tempted Quetzacoatl and seduced Louis Valdez. The effect of Carrillo’s largest masterworks produced the frontera equivalent of Saint Chapelle. Only instead of the light being saturated with the hues of stained glass, it is the resonance of enormous canvases- all talking to each other in Carrillo’s muscular language of tropical sexuality and archetypal innuendo- that makes the lasting impression. The atmosphere shimmers with burnt oranges, that dried blood mahogany that was his signature, lustrous turquoise and a robust Aztec yellow. Painted in the early to mid eighties, they are the work of a giant, of a man widely regarded as a leader of American painting, Hispanic or otherwise. As a teacher, Eduardo was inventive and resourceful. He personally dug the clay for a native pottery course and conducted original research for his art history course on Mexican art. An emotionally as well as intellectually engaged teacher, he inspired and influenced the careers of scores of students. He always trusted his instincts- rarely worrying about critics, who invariably praised his work without quite grasping its full measure. Ed painted and taught like he lived- letting go, surrendering to the fullness of his moment in the universe- trusting that moment completely. For all of us left in a world without Eduardo Carrillo, his moment was not nearly long enough. An overflow congregation of friends, colleagues, family and students from all over the Americas attended a memorial celebration of Eduardo Carrillo’s life and legacy on Sunday, September 28, 1997, at the Elena Baskin Visual Arts Courtyard A painting and drawing scholarships been established in his name. Contributions to the Eduardo Carrillo Scholarship may be sent to the Arts Development Office, Division of the Arts, UCSC, Santa Cruz, 95064. An internationally recognized artist, Carrillo’s work was anthologized in many art-books and articles in the most influential journals, from The New Yorker and Artweek, to the Los Angeles Times and San Francisco Chronicle. His work has been exhibited for 40 years in dozens of solo and group shows throughout the US and Latin America, and is preserved in such public collections as the Oakland Museum, Yale University Art Gallery and Sacramento’s Crocker Art Museum. His monumental tile mural, commissioned by El Pueblo de Los Angeles in 1979 to honor Father Hidalgo, maintains a dramatic presence in Carrillo’s metropolitan home town of Los Angeles. A gifted painter, leader of contemporary American and Hispanic art and patient teacher, Eduardo is survived by his wife, Alison Keeler Carrillo, of Santa Cruz; his daughter, Juliette Carrillo of Los Angeles; his son, Ruben Carrillo of Honolulu; three sisters, Georgina Ossorio of Miami, Mary Black of Burlingame and Patricia Mullins of Huntington Beach; a brother, Alex Carrillo of Northridge; a stepdaughter, Bhavani Parsons of Paris, France and one grandson, Kino Eduardo Carrillo of Honolulu. The memorial text was written by Christina Waters, University of California, In Memoriam. It’s a great joy to me, even in these circumstances, to say anything about Eduardo because I have been his ardent fan for about forty years. I knew him when he was a young man at UCLA and I instantly knew that he was an extraodinary human being of great gifts and he has just continued to demonstrate that the rest of his life. I’m happy I got to see him after UCLA and got to see and enjoy his work. He had the one thing that I think is necessary: he had a sense that he possessed the whole universe of painting and he moved around in it without any kind of hesitation. He had a feeling of freedom into that universe which is absolutely remarkable for a painter because most are tied down to this or that, mainly to their own egos. Marvelously, Eduardo had very little ego, truly a marvel. But he was an immensely strong person and it was evident even when he was a young man. I’ve given my interpretation of his life many, many times to other people exhorting them to follow his path. What happened was he applied for a grant. He applied for a grant because he loved Hieronymous Bosch. He was absorbed by him I mean passionate about him. And he didn’t get the grant. Now, you know, what do most people say? Oh dear, I didn’t get the grant, what will I do? Apply for another grant! What he did was earn money in a very difficult way, he had to bicycle down to the middle of L.A. to work like a Billy-O in a machine shop for I don’t know how long. And he got the money together and he went to Spain because that is where Bosch is. He simply submitted himself to Bosch and in that submission, of course, he became enormously powerful as a painter. The worst thing that can happen to people is they never submit themselves to anything, and there they are floating in a kind of limbo and it doesn’t matter what they do. The power to submit yourself and through that become strong is the greatest thing anyone, a painter or anybody, can do, ceratinly anyone in the arts at the present time when there is no powerful traditionn to make you this or that. You are on your own to create not just yourself but the whole meaning of your life, in terms of art. So, he was able to do that. It’s a great gift, of course, to be able to do that. He left for us such a glorious view into the world of painting. There is not any painting that you can look at that isn’t marked by joy. This is what he was in person, a kind of marvelous sweetness and strength and joy lived in him all his life. This ia such a rare quality that our loss is enormous. Even the people who never knew him, never saw him or had anything to do with him have lost something of immense value, and something that will not be repeated anytime soon. Mary Holmes was a gorgeous, long-legged painter, teacher and mother who loved men even more than she loved horses. She was forty five, smarter than most, outspoken, iconoclastic, with a quick eye for what mattered: painting. She was then and still is at ninety an inspired painter and teacher, a delightful person, a true breath of fresh air. She was a lecturer in Art History when Ed was nineteen and an undergraduate at UCLA. Mary liked Ed immediately and he liked and respected her right away too. In her classes she spoke about the seriousness of art, the richness of painting; that with authenticity and great courage the masters pull their inspiration from within; that the mind must be set aside in order to see; about the curse of self-expression and how without discipline there is no freedom. Mary saw that Ed had a unique gift. She supported his good instincts and encouraged his Spanish quest. She wanted him to discover his own heritage, the rich tradition of Spanish painting. In 1967 Mary moved to Santa Cruz to teach at UCSC where she later named Ed for a faculty position in painting. She knew his extraordinary talents and that his contribution would be significant. I always loved visiting Mary with Ed because the mutual affection and respect were palpable, great souls both. I felt honored to be there. Ed at age 23 joined his good friend, John Fox, 29, a graduate student in painting at UCLA, with the intention of living together in Madrid for the year. September 1960, Ed arrived in Madrid. I had spent six weeks in Granada getting started on my Spanish where I befriended Antonio Garcia y Pestana, a young veterinary scientist from Madrid doing military service in Granada. As soon as we were introduced to Antonio’s family we were adopted by these wonderful people. Kind and humble, the old father was a postal inspector. In our new status as family we were expected to join in the Sunday “comida” for the whole year. The whole family would gather at the long table, about fifteen of us, aunts, uncles, and kids. After eating all afternoon we would go into the next room to listen to Cuban and Spanish music, all kinds, popular and classical, Rodrigo’s great Concierto de Aranjuez for guitar. Ed loved the music after dinner. He brought his guitar to Spain and these sessions inspired him to keep playing. Some of Antonio’s friends helped us secure a bare-walled-no-furniture-six-room-flat that gave us plenty of room to paint with each a pad to sleep on. Discovering the huge and fascinating Madrid flea market made it a snap to furnish the place. We liked to wander into the alleys near the flea-market to hear the haunting fiery street flamenco of the gypsies. But we only spent a couple of months in this apartment as it turned out our friends got us a good deal on a party house. They provided everything, wine, women, music and even small “red light bulbs” for atmosphere. Fun for awhile but after a couple of months we moved again. Ed had met an old Italian painter who told of having a studio fifty years earlier in a decrepit 17th century long-out-of-favor palace. We checked it out in old central Madrid on Calle de la Luna, amid streets so narrow that you couldn’t step back to see it was a “palace”. We rented a huge room from the old church polychromer who was in charge of the place. He restored carvings, icons and statues and showed us a secret room full of really old broken sculptures. He ended up teaching us gold leafing techniques, gilding, mixing pigments, and showing us where to buy esoteric art supplies. He gave us a tour of the palace which was full of poets, painters and sculptors from all over the map. It took a whole city block, had a mammoth courtyard, huge staircase, very high ceilings, monster walls and no electricity. To gain entry we used an old six inch key to open a door within another door that must have been twenty feet high. We had to carry a bit of a candle in the pocket for finding our way down the long corridors. Day or night we passed people in the halls carrying candles. Directly below in a cobbled plaza was our night table for reading, writing, socializing and sometimes over indulging in vino rojo corriente ($.07 per bottle refill. Note one whole year in Spain in 1960-61, all expenses, cost me $1,000.00). I was called Juan Zorro over there. Ed and I figured it would be the only time in our lives when we would live in a palace so we might as well make up some cards. I had mine printed with “Juan Zorro y Lee”; my mothers name is Lee. Ed had cards printed up too: “Eduardo Leonardo Carrillo y Leree” with the name and address of our palace studio. During the year before we left for address of our palace studio. During the year before we left for Spain we had shared a huge studio loft with Chas Garabedian and Herbie Hazelton in L.A. So we had already been living together that way. We got along very well. It was all easy as far as that goes. Hitch-hiking was also uncommon. In the spring we walked and hitched for a couple of weeks in the south- Easter processions in Sevilla, on to Granada. We always visited the great churches and palaces, like the Alhambra. I remember the gypsies had lived in along time. They were out of town, up a hill. You went inside, they were big and beautifully painted white, lit with little gas-lamps and candle lanterns, like a nightclub for listening to music and watching the dance. We often listened to music in Madrid but I remember being in the caves was better. The best dancers were there, those really fiery dancers. We sat for hours and watched them. Ed loved the music. He always carried his guitar and gravitated to the music. We arrived in Alicante on the coast, got in late, had sleeping bags, and said, what the heck, let’s just sleep in the old dried riverbed. We could her gypsy music and see campfires down the ravine. So we found a comfortable spot on the sandy rocky bottom and bedded down for the night. Soon we could feel these thumps on our sleeping bags and here were these big bullfrogs jumping around, bouncing off us! They were all over the place jumping on us like we were just lumps in the sand. Thumping and croaking, they kept it up all night. The next night was another story. We sacked out on the beach in town, next to a big wall. We were lying on our backs looking up at the night sky and here we saw looking down from this wall more of these three cornered hats. “Guardia de Sevilla.” They looked down and shouted, “Que Leche!” which in Spain is part of a long exclamation of swear words that gets pretty gross, but just “que leche” was used pretty frequently in wonderment meaning “Wow, what’s going on here, unbelievable!” Again, in 1960 they were not used to gringos sleeping on the beach. Then they started speaking to us. We could both speak Spanish by then, and they finally left us alone. We were questioned many times by the by the “Guardia.” Sometimes they thought we were “Ruskies”. We always tried to leave them bewildered but smiling. We took day trips to see amazing old edifices. Outside of Madrid is La Iglesia de San Francisco de la Florida with its inner dome with all these figures looking down on us from a balcony, painted by Goya. In another small town is El Escorial, a massive masonry palace built in the 1500’s by King Philip II. The outside is gloomy and severe, but the painting inside were fantastic. Especially this one by El Greco, ” The Burial of Count Orgaz”, where the body of the Count is in a suit of armor like a beautiful, luminous beetle. Ed loved that painting. On another trip we hitched to Toledo for more El Greco. In Madrid we attended poetry society readings and drawing sessions at El Circulo de Bellas Artes, the famous old academy where Goya hung out. But Ed’s main focus was painting at the Prado several days a week. He was always looking at the paintings trying to figure out what made them look like that, give them that glow. He got interested in glazing techniques and studies the formulas of the old masters. To glaze is to brush on thin, almost transparent layers over colors that you already established thus influencing and changing those colors, enriching the overall tonality. Adding a warm or a cool glaze lets the underneath color come through. The work has to be dry enough otherwise you’re smearing the glazing into the paint instead of over it. Ed got really good at this. He would melt down rabbit skin glue with some beeswax and sometimes add an egg yoke or reddish earth oxide. The color green seems to have gained some magic for Eduardo in Spain. From that time glazing was a technique he used to pull his colors together. I thought, what’s he up to? And I decided to go along with it. He introduced me to these ladies. “Well, do you want to come back to our palace for a nightcap?” They couldn’t believe it, we had completely snowed them. We had both gotten so into it, they couldn’t believe it! They laughed their heads off. They were fascinated with where we lived and wanted to see the paintings. Night life in Madrid started early. If a guy had a dater with a young lady he picked her up around five thirty and went dancing or to a show, and he had to have her back home by dinnertime around ten. Everybody was playing games with the Catholic religion, like the light bulbs in our flat to create a certain dimness. Antonio and his friends would take us to a place that would be well-lit and then when they had some girls they wanted to be more intimate with they tried to talk these gals into going to a different kind of a club that would be so dark you could hardly see across the table. I began to realize, well, these places are all set up a little differently and everybody knows the game around the Catholic Church. Antonio loved to show us the nightlife. One evening he took us to the Casas de las Provencias. In Madrid, the capital city, each of the wine growing provinces has its own Casa, de Segovia, Casa de Valencia, Casa de Extremadura, big mansions, and they were near each other in a certain district. We were walking and allowed ourselves to be led by Antonio and his friends. Also with us was this young American architect from San Francisco that Ed had met at the Prado. He was on a mission around the world photographing the great edifices and art structures. So he went with us. At each Casa they’d only give you one glass of wine and they each had their own way of presenting it. I remember in Casa de Jara they lifted this bottle high in the air and poured it to a glass they held way down below. They explained the wine had to be aerated. So we went along with everything, to each one of theses places and I tell you, by the end of the night six of us guys were walkin’ down the street holding each other up, singing, bouncing off the walls, weaving from one side of the street to the other and howling by the light of the moon. We always took in a lot of nightlife. In Spain, like Mexico, every month there are a few saint’s days and some group is always making a fiesta with all this color and music. Siete de Julio found us in Pamplona for the Feria de San Fermin where Ed “runs with the bulls” and goads me into doing it the next day. He had the only pair of sneakers between us, but we were about the same size so I used his. We were awakened very early by the voices of women singing. We dressed quickly and hustled out to join the runners at a little plaza. There we waited. Nobody said much. To warm us up some Spanish men kept pulling us into these tiny bars that were all around and giving us shots of something. I never knew what it was but it was strong. They offered us advice like, don’t use up all your energy running fast in the beginning, pace yourself. Police had barricaded the road and we couldn’t start until the cannon blew, so we were out there waiting, more nervous as the moments passed. Finally they released about ten cows, you could hear their bells, and the bulls came after the cows. Police moved the barricades. The cannon roared and we started to run. Side roads were blocked off with big, thick timbers so there was only one way to go, straight ahead. On balconies above, lining the streets were people singing and playing music and women throwing flowers. As I was racing along I kept swatting a man behind me who was grabbing onto my belt. I got to a curve and pressed myself to it, terrified, with huge bulls rumbling past only inches away. A few men made it into the ring. I wanted to get into the ring too because Ed had been in the day before. So I ran in after the bulls. It was 7am and the place was full of spectators. Then they released small bulls with their horns cut off and leather bound around their nubs and we all became amateur matadors for awhile. It was quite a combination, the running, the music, the drinking. who especially liked Ed and who took us around. The town was so crowded that the only room we could rent was a tiny hole in the wall shared by six men. We took turns sleeping in shifts around the clock. After days of continuous parties and bullfights we were exhausted and so we hitched a ride out of town in a Duex Cheveux. That night we camped in the Pyrennes. What’s great about those cars is the seats come out and you can sit on them around a campfire. We were on our way to Paris. It’s hard to be a widow. People are afraid of me. They don’t know what to say. Who knows what to say? I don’t know what to say. I’m speechless most of the time. They don’t know whether to mention “it”. Instead of saying, “How’s your grieving coming?” which doesn’t seem that hard to think up, I mean, it’s relevant anyway, they will talk about anything else to distract from their discomfort about not knowing what to say. I feel for them. It’s most awkward. Say, “I’m so-o-o sorry,” and then touch me. Yes, I forget that he is gone when I am busy with something else,but in-between my forgetting I remember. The more I cry, the more I shine. I see it in my skin and eyes. experience of marriage. Not so when a woman has lost her true love. “The abyss?” I said. There’s an abyss? I’ve heard about it, is this it? This feeling of free fall down a black hole where I have no idea where I will land? Yeah, I said, that’s where I must be, in the abyss. Every morning I wake up and fall farther. Oh, this again. Night is the high point of my day when I reconnect with Ed. I remember a dream where we were lying together and I was begging him, oh please Ed, can’t we be together in some way, can’t we at least be lovers? He closed his eyes and enfolded me in his arms, no, my darling, not now. I sobbed as he rocked me gently. It is hard enough for him to die. For him to stay dead is my outrage. Everyday he is dead again. Everyday I remember. It still is shocking. Dead? No! Impossible! Our life was my life, how can it be over? And there is nothing I can do but submit to the vicious truth. By nightfall my horror is complete and has broken down to resignation. I surrender to sleep, the blessed balm, and into the arms of my beloved. This much I know. If you want to comfort a widow there are four things that make a difference: show up, hug, listen and cook. Don’t get me wrong, Cards are nice, especially as they evoke memory and tears. If you want to feel better, like you expressed your sorrow, done your part, send a card or call. enough. The truth is this is a solo journey. There is nothing anyone can do to relieve the pain. That is the frustration of it. If only there were a pill, a platitude. But no, there is nothing save to weep and dream.